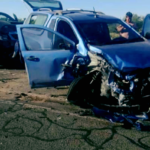 A collision between two vehicles on the road between Mariental and Keetmanshoop resulted in the serious injury of a child. 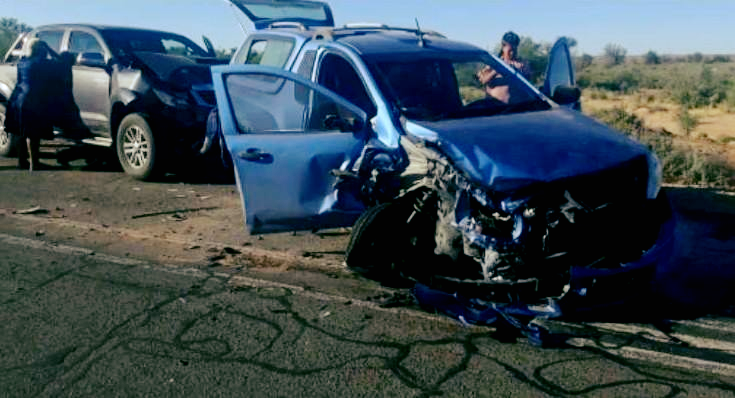 The head-on collision occurred about 97 kilometres from Mariental on the way to Keetmanshoop when two bakkies crashed into each other. The cause of the accident is not yet clear. Besides the fatal crash on Friday morning during which the 50-year-old Sergeant Tjilombo Petrus Mandju and a female police officer, Sergeant Muduva Maria Eleoteria Mayinga (42) died instantly as a result of a head-on collision with a truck transporting cargo to Zambia several other incidents where motor vehicle accidents occurred during the past week were reported by the Police Public Relations Division. On Monday 24 December at around 06:10 at the Ombafi Village on the Outapi-Oshakati main road, the driver of a white Toyota pickup, who was driving towards Outapi, lost control over the vehicle and it overturned. The incident resulted in the serious injury of a little three-year-old boy who was a passenger in the vehicle. The child sustained a serious head injury and was admitted at Outapi State Hospital. A 59-year-old woman who was driving a Ford Bantam pickup with registration number N 3390 M in a southerly direction lost control over the vehicle and it left the road and overturned. The accident happened at around midday on Christmas Eve about 30 kilometres from Mariental. Both the driver and her 79-year-old passenger sustained slight to moderate injuries and were admitted to the Mariental State Hospital. At around 23:00 on the same day on the road between Omuthiya and Ondangwa near Oniipugulu Village, Onyaanya Constituency, a 58-year-old driver of a white Toyota pickup, registration number GRN 4007 smashed into a donkey which reportedly ran into the road. The front bumper of the vehicle was damaged, but the driver was unscathed. On Christmas Day a 61-year-old pensioner died on the spot after he tried to overtake another car on a gravel road when he lost control over the vehicle and it overturned. It is further alleged that the deceased who was the owner and unlicensed driver of the White Toyota Fortuner was allegedly driving from Etilyasa village to Okahao when the fatal incident occurred.